An ancient forest has thawed from under a melting glacier in Alaska and is now exposed to the world for the first time in more than 1,000 years. Stumps and logs have been popping out from under southern Alaska's Mendenhall Glacier — a 36.8-square-mile (95.3 square kilometers) river of ice flowing into a lake near Juneau — for nearly the past 50 years. However, just within the past year or so, researchers based at the University of Alaska Southeast in Juneau have noticed considerably more trees popping up, many in their original upright position and some still bearing roots and even a bit of bark, the Juneau Empire first reported last week. "There are a lot of them, and being in a growth position is exciting because we can see the outermost part of the tree and count back to see how old the tree was," Cathy Connor, a geology professor at the University of Alaska Southeast who was involved in the investigation, told LiveScience's OurAmazingPlanet. "Mostly, people find chunks of wood helter-skelter, but to see these intact upright is kind of cool." The team has tentatively identified the trees as either spruce or hemlock, based on the diameter of the trunks and because these are the types of trees growing in the region today, Connor said, but the researchers still need to further assess the samples to verify the tree type. A gravel layer about 4 to 5 feet (1.2 to 1.5 meters) high appears to have encased the trees before the glacier ultimately advanced enough to plow over them, snapping off limbs and preserving the stumps in an ice tomb. Taku Glacier, located south of Juneau, is currently triggering this same process as it advances over a modern forest of cottonwood trees, offering the researchers a chance to observe the process in real time, Connor said. Unlike the growing Taku Glacier, which accumulates snow at a high elevation and thus is well situated to grow, the lower-elevation Mendenhall Glacier has retreated by an average rate of about 170 feet (52 m) per year since 2005. This year's summer retreat has not yet been calculated, but the team expects it to be relatively high due to unusually warm summer temperatures, Connor said. Glacial retreat worries many locals who are concerned about the threat of rising sea levels and loss of major freshwater sources that they rely on for drinking water. Anchorage, the state's most populated city, relies entirely on the retreating Eklutna Glacier for its drinking water. Still, glacial retreat does offer an interesting opportunity to investigate well-preserved remnants of an ancient world. 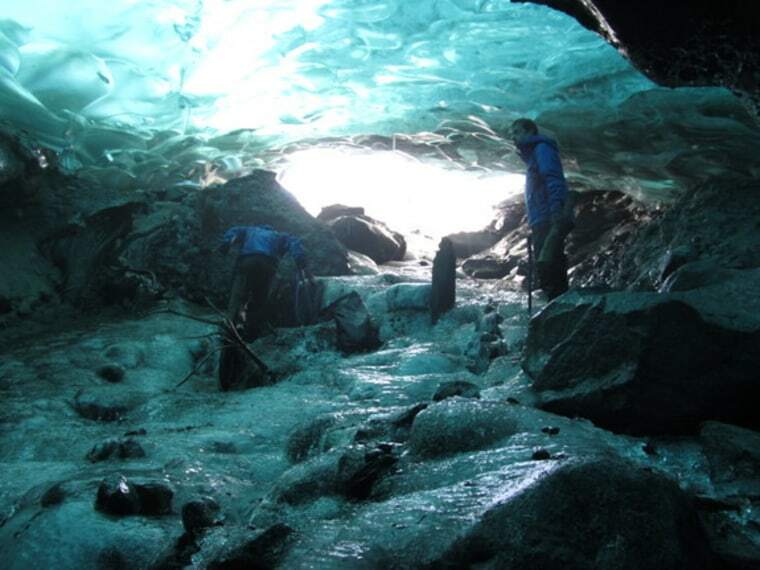 The team plans to return to the Mendenhall Glacier to dig through sediment in search of pine needles associated with the trees, along with other vegetation. They also plan to measure the growth bands of the trees to determine how old the trees were when they died. "These are relict stories, and piecing them together with radiocarbon dating and stratigraphic work would help piece together the chapters of the story," Connor said. The researchers have not yet published the results from the investigation but plan to do so once they have gathered more data. Follow Laura Poppick on Twitter. Follow LiveScience on Twitter, Facebook and Google+. Original article on LiveScience's OurAmazingPlanet.